Once an organisation has grown to encompass more than a handful of people it is important there are a clear set of values and an ethical decision-making process. This is particularly important where the organisation is seeking to foster a particular culture, where it wants to be seen as organisation that embodies ethical decision making. Identify the key values and principles that are involved with the issue. What is the meaning or limitation of the competing value for example? Rank the ethical principles which you believe to be most relevant to the issue. These will provide the first stages. What are the reasons for prioritising them the way in which you have? Build a coherent strategy to reflect these. Once the central dilemma has been determined, develop an action plan that is consistent with the ethical principles that you outlined. Confer with your colleagues or client about the consequences of any course of action taken to resolve the dilemma. Communication and transparency are often the keys to any problem. Can you support and justify the action plan fully based on the values that you have attributed to the issue? Then implement the plan using the most appropriate skill set for the issue. Employ sensitive communication and skilful negotiation to portray your ethical manner. Always reflect on the outcomes of any ethical making process and decisions. Evaluate how they have operated and if they have worked effectively. Would you employ the same tactics again or does the process need to be advised or adjusted accordingl y? 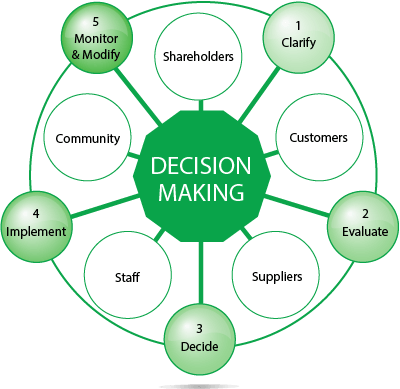 At Elgood we use this decision-making process alongside a set of business values as part of The Ethics Challenge, a business simulation game to help participants practice values-based decision making. The Ethics Challenge is a valuable experience for anyone with responsibility for making decisions which will impact on the credibility of their organisation and for ensuring the long-term stability of their business through the provision of sufficient profit. It can be adapted to reflect the organisation’s values, its key stakeholders and the dilemmas it faces. To learn more about ethical decision making read out White Paper Ethics in Business Decision Making and look at our business simulation game which provides a forum for discussion and application of the framework.